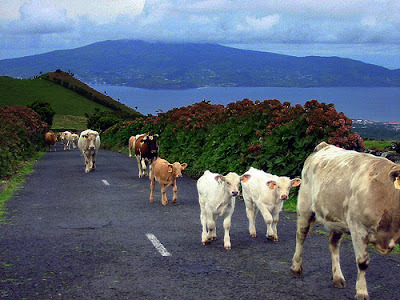 Graciosa Island, also known as White Island, is the northernmost of the Central Group of the Azores Islands. The island has an area of 60.84 km² in an oval form, with a length of 10 km and a width of 7 km. The entire island is a large stratovolcano which rises from the floor of the Atlantic Ocean. The southeastern end is dominated by a 1.6 km wide caldera, known as Caldeira. The landscape of Graciosa enchants visitors with its tree-dotted round hills, vineyards that lie between stone walls, checkered fields of tilled land, whale-shaped rocky formations, sulphuric caverns, and bird-nested islets, which mixed with the white village houses and the onion-shaped dome windmills, provides for a truly idyllic experience. 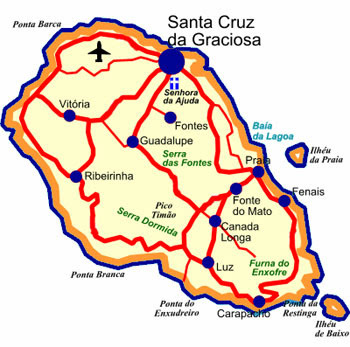 Graciosa Island was likely first discovered in 1450 and settled by Vasco Gil Sodré, arriving from Terceira Island. Vasco Gil Sodré cleared much of the land and built a custom-house on the island, but the first captaincies of Graciosa were given instead to Pedro Correia da Cunha who married the sister of Christopher Columbus’ wife and Duarte de Barreto. In the ensuing centuries, Graciosa became an agricultural production center of wine and wheat, explaining the frequent corsair attacks it suffered during the 16th and 17th centuries. Graciosa Island is full of natural gems. The sulphur caverns of Furna do Enxofre are probably the most unique and renowned of the island’s attractions. The caverns are a geological phenomenon not found anywhere else in the world. It was first visited by Prince Albert of Monaco, the famous oceanographer of the 19th century. At Furna do Enxofre, a deep tunnel of 100 meters is found in the interior of the crater of a former volcano. There is a huge grotto 80 meters high with stalactites and a cold underground lake of sulphurous water. The best time to visit the cavern is at noon when the sunlight reaches the interior producing a dazzling light show. Besides Furna do Enxofre, there are other interesting but less spectacular caverns like the Manuel de Ávila, Furada, Linheiro, Bolos, Lembradeira, Calcinhas, Queimado, Labarda, Cardo, Gato, Castelo, Vermelho, Urze, Cão, and Luis. Hiring a guide and renting equipment is recommended for exploring any of these caves. The Carapacho Hot Springs are a must as well; you’ll find spring baths that are rich in medicinal mineral waters and help treat skin and rheumatic ailments. Carapacho is located in the southern end of Graciosa Island and is a great fishing and swimming destination as well. Bird-watching is also popular in Graciosa. The islets along the coast of the island like Praia and Baleia are habitats for numerous sea birds. Hiking, peaceful walks, and picnicking on the island are particularly enjoyable as well. There are a number of hills that are covered with unique vegetation like beech-trees and Japanese cedars. These hills offer sweeping views of the island and sea. The Serra Dormida, Serra das Fontes, Serra Branca, Pico Timão, and Serra do Facho are just a few of these high peaks. 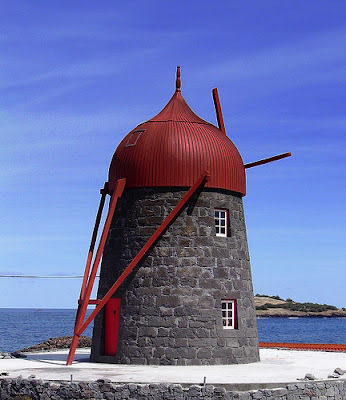 While atop any of them, be sure to look out for the myriad picturesque windmills that Graciosa is so well-known for; many of the windmills are located atop the hills of Praia.